Darren Criss and Betsy Wolfe performed and composers Jason Robert Brown and Robert Lopez accompanied in this pleasant concert of eclectic show music. A pulsating medley from Kander and Ebb’s musical Chicago was the thrilling second act opening number of The New York Pops’ pleasant concert of eclectic show music, 42nd on 57th: Broadway Today. The evening opened with a lush and dramatic selection from Andrew Lloyd Webber’s The Phantom of The Opera. Les Misérables also received a superb symphonic treatment, as did the lovely overture from Ragtime. Hearing these familiar melodies performed by this supremely accomplished 78 piece orchestra was uniquely enthralling. 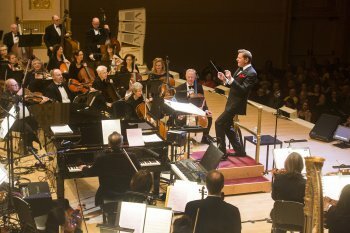 The New York Pops’ music director and ebullient conductor Steven Reineke hosted the event. Mr. Reineke explained that the concert would focus on music from the last 40 years, though there were a few numbers from earlier years. Broadway, Off-Broadway and even a show that closed on the road were represented with an emphasis on recent musicals. Two very talented young performers were the vocalists: Darren Criss, known for his role on the television series Glee and for appearing on Broadway in leading roles in How to Succeed in Business without Really Trying and Hedwig and the Angry Inch, and Betsy Wolfe who has appeared on Broadway in Bullets Over Broadway and The Mystery of Edwin Drood. Their chemistry and bantering together was highly enjoyable. With flowing blonde hair, statuesque beauty and possessing the charisma of a leading lady, Ms. Wolfe wore five dazzling gowns during the performance including a slinky beaded black one with shear portions for the finale, a suitably emotional “Maybe This Time” from Cabaret. For her soaring rendition of “Let It Go” from the animated movie musical Frozen, she was accompanied on piano by its composer Robert Lopez. She was delightful singing “Unusual Way” from Nine and in riveting voice for “Meadowlark” from The Baker’s Wife. Genial, boyishly appealing, and utilizing his fine tenor voice, Mr. Criss wonderfully played guitar as he performed a beautiful folk rock style version of “I Dreamed a Dream” from Les Misérables. Using an Irish accent he sang “The Streets of Dublin” from A Man of No Importance. A simple “I’d Rather Be Sailing” from A New Brain was quite effective as he played piano. His “I Love You Betsy” from Honeymoon in Vegas was breezily comical. Mr. Reineke joined him for a hilarious duet of “You and Me (But Mostly Me) from The Book of Mormon. Together they did several marvelous duets that included Ms. Wolfe’s delirious performance of Stephen Sondheim’s giddy tongue twisting “Getting Married Today” from Company with Mr. Reineke joining Mr. Criss for one of the male roles. “Suddenly Seymour” from The Little Shop of Horrors showcased the duo’s comedic abilities and “Falling Slowly” from Once was quite romantic with Mr. Criss playing guitar. There was a touching “Before and After You” from The Bridges of Madison County with that show’s composer and lyricist Jason Robert Brown accompanying on the piano as he did for Ms. Wolfe’s stirring version of “A Summer in Ohio” from his The Last Five Years. A rousing “Take Me Or Leave Me” from Rent was the uplifting encore. Their winning presences and talents combined with the dynamic musicianship of The New York Pops along with the interesting selection of numbers, made 42nd on 57th: Broadway Today perfectly entertaining. Delightful revival of the Kaufman and Hart comedy classic headed by James Earl Jones, Rose Byrne and Elizabeth Ashley has message that is still relevant.